Bus tours race you through the country at a breakneck pace because they’re on a schedule. Bags out in front of your hotel room door at 6:30. Breakfast at 7. Departure at 8. Rush-rush-rush through the day, being led around like sheep with walkie talkies jammed into your ears. Exhaustion. No time for taking photographs or experiencing the real countryside. European Focus is the antidote to this hectic, jam-packed “vacation” which you need a vacation from just to recover from the hectic pace. Our philosophy is to live as the locals do. We take the back roads. We stop to take photographs. We talk with the locals. Our innkeepers are like family, and they treat us like family. And, our guests do something that Trafalgar, Kontiki and Rick Steves just can’t claim. More than half of them come back for future tours. 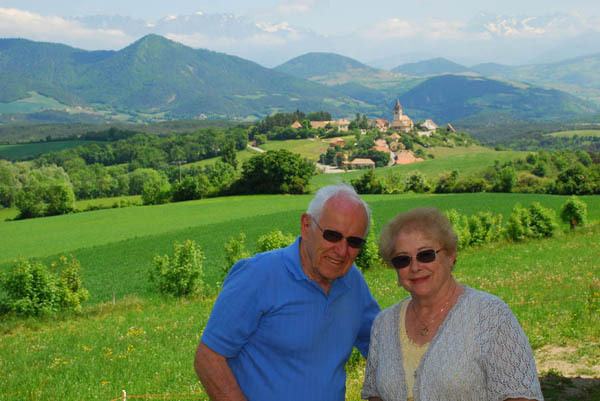 We truly spoil our guests with authentic European experiences. Come and see for yourself, as Bob and Betty are doing right now for the second time. Trip #3 for Betty and Bob to England, Ireland and Wales is in the planning stages now. 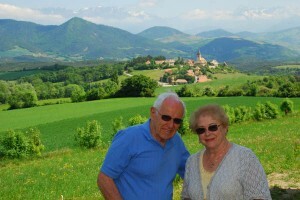 Two-time guests Bob and Betty Whittemore with Le Percy, France in the background. 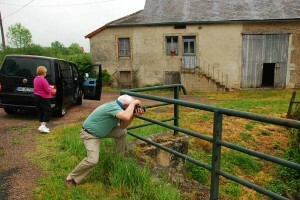 We love stopping to capture images of the countryside on our slow travel experiences in Europe.